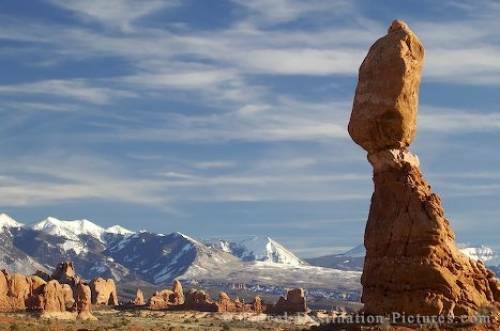 Possibly one of the most well photographed rock formations in Arches National Park, Utah is Balanced Rock. Balanced Rock is a free standing formation of a base with a large upright rock seemingly balanced on the top. The snowcapped La Sal Mountains provide a backdrop to Balanced Rock and The Windows Section of Arches National Park. A full day can be spent in Arches walking a few of the many tracks and exploring the wonders of nature. Arches National Park is situated near Moab in Utah, USA. Picture of Balanced Rock in the Arches National Park in Utah, USA.